One of the marks of the 50s sci-fi cinema was how seriously these films often took themselves. In spite of the crude effects, grisly monsters and ridiculous plots, these films were totally committed to their central ideas and themes. Just because a film's central character is a giant praying mantis left over from the prehistoric era, resurrected from a block of ice by volcanic disturbances, doesn't mean that the film can't incorporate an utterly straight-faced infomercial for America's Cold War defense systems. That's how The Deadly Mantis begins, with an incongruous semi-documentary segment that aims to educate viewers about the fascinating new technology of radar and how it's being used to protect America against an evil Commie invasion. Well, OK, the deadpan announcer doesn't actually say that, but that's the unspoken meaning of these scenes, which establish the 1957 film as a true product of the Cold War era. The film is all about protecting America from threats that buzz in from outside the border. The threat in this case happens to be a massive carnivorous insect, but it could just as easily be enemy bombing planes or missiles. The film is a rallying cry for solidarity, uniting against the common enemy, and ultimately the big bug is defeated because common Americans — a ground force of dedicated ordinary citizens who volunteer to watch out for enemy activity — band together to help out, because civilian professionals leap to the government's aid at a moment's notice, and because the journalists trust the government's word implicitly enough to report only what they're told and no more. That's the subtext, and the film's serious message. Even so, at its heart The Deadly Mantis is still just a film about a really big, really hungry bug, and as such it succeeds only to the extent that its voracious monster is creepy and frightening enough. Certainly, the mantis is about as good as one expects for this kind of creature, a giant puppet with an appealingly textured surface and an especially expressive face: oftentimes, the creature seems to be smiling as it plods towards its victims, a bit of anthropomorphism that somehow only makes it even creepier. Of course, pedestrian director Nathan Juran does the creature no favors by inserting long shots in which the camera pans across the length of the insect's body, shots that only call attention to the artificiality of the threat and the basic inertness of the puppet. Much better are the dead-on shots of the creature's face and threatening forelimbs, emphasizing the terror of facing this monstrosity. Unfortunately, for much of the film's length the creature is offscreen altogether, as paleontologist Ned Jackson (William Hopper) investigates the mysterious deaths of several soldiers at a remote radar station near the Arctic Circle. Jackson heads to the area along with his inquisitive assistant and photographer, Marge (Alix Talton), and the duo join up there with Colonel Parkman (Craig Stevens). The script makes a few lame attempts to generate some sparks between Parkman and Marge, but the acting here is all so limp that such efforts are doomed. The mantis has more charisma than any of his prey; the filmmakers had a bigger chance of getting some romantic chemistry going with the insect. Of course, the lack of any human interest here doesn't stop the film from spending much of its time with the non-insect characters as they try to figure out what's killing people up at the North Pole. 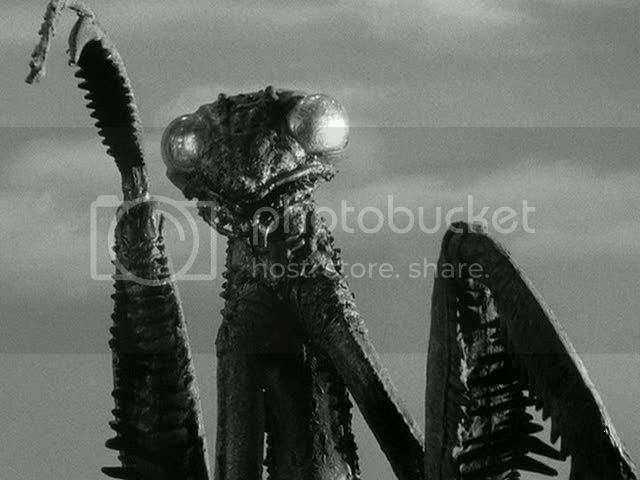 Hey, B-movie makers, I have a tip for you: if you want us to wonder what mysterious thing is causing so much damage for the first half-hour of your movie, don't name the film The Deadly Mantis. The result is that nearly half the movie is spent yelling at the screen: it's a really big mantis, you idiots, figure it out already so we can finally see the damn thing. Still, at its best the film does generate some compelling suspense from its central premise. The insect soon enough escapes from the Arctic Circle, heading south into the mainland USA, where it terrorizes Washington, D.C., even climbing to the top of the Washington Monument like an exoskeletal King Kong. The film's best sequence is a long, eerily quiet segment when a thick, dense fog settles over the area. Marge and Parkman are driving near D.C., listening to reports coming in over the radio of the terrible "accidents" happening in the area. The monster creeps through this dark, foggy soup, occasionally looming up to attack a bus or derail a train. The fog helps obscure the ungainly nature of the creature, increasing its effectiveness — when only its blank, empty eyes are visible, glowing faintly through the fog, it's much more frightening when the thing is out in the light of day, revealed as a typical Hollywood construction. This is essentially a generic giant monster film, delivering a few effective scares but little else. Edward Dein's The Leech Woman is startlingly rich and complex for a B-grade horror flick with such a sensationalistic title — it calls to mind the films of producer Val Lewton, who, given a pulpy title, would often mine unexpected depths while playing down the horror premise. Dein's film hardly reaches the visual beauty or sophistication of Lewton's best work, but his serious approach to the material recalls Lewton. What could have been a typical B-movie shocker is instead a poignant, insightful examination of aging, beauty and the differential treatment of men and women in a society obsessed with youth and beauty. It's apparent from the film's very first scene that this is going to be something different than the usual B-movie fare. The scientist Paul Talbot (Phillip Terry) and his wife June (Coleen Gray) are arguing at his office, as June drinks and grows progressively more distraught. Paul is a distant, heartless man, openly disdainful towards his wife and turned off because she's middle-aged, no longer a youthful beauty. For her part, she is slightly worn, disheveled, her eyes ringed with black — she is aging and depressed and fading away, and the loss of her husband's love and affection have made her bitter, driven her to drink. It is a heartbreaking scene, one that makes the parameters of the couple's relationship apparent in the subtexts of their conversation, a tortured back and forth of insults and passive-aggressive retorts that ends with the ultimatum of divorce. Nevertheless, Paul hastens to make up with June after the shriveled old African woman Malla (Estelle Hemsley) visits him in his office, offering him the secret of reversing the aging process. Paul makes up with June and heads to Africa with her, pursuing the secret that rests with a mysterious African tribe. They discover the secret, but they also find that it involves killing a man — the drug from an orchid is activated by plunging a hooked ring deep into the brain of a hapless victim, who dies for a woman's youth. June gets her youth restored to her, and she also gets her revenge on her despicable husband, who loved her only as long as she was young and beautiful, before growing distant from her as she aged, casting her aside. But when she returns to society, she finds that her newfound beauty is shortlived, and will only last as long as she continually replenishes her intake of the African tribe's drug. After going without it for too long, she shrivels up, aging far beyond her slightly worn middle age into a wrinkled old hag. So June becomes a parasite, living off the lives of men in order to retain her beauty, posing as her own niece in order to seduce the young lawyer Neil (Grant Williams). Gray's performance is fantastic, covering a very wide range, from the despairing alcoholic of the film's first half, to a grieving old widow, to the predatory young girl she is when supplied with the drug. She plays her younger self with a peculiar urgency, as though eager for sensual experiences. In one particularly memorable scene, she blocks a doorway as Neil tries to leave, thrusting her body at him, smiling seductively, her body suggestively sprawled against the door as though offering herself to him. There's a desperate sexiness in her portrayal of the younger June, as well as an unearthly confidence: she's not just playing a young girl, she's playing a young girl with the mind of an experienced older woman. The fascinating depth and complexity of Gray's performance is matched by the film's treatment of its themes. One early scene begins with a tight closeup of Paul talking to another man, planning their course of activity. Then Dein's camera tracks backward, expanding the shot until June appears in the corner of the frame, away from the men, away from the action, without a voice in their plans. This simple camera move subtly underlines the conventions of Hollywood films, where the woman disappears as soon as some action is called for. The men are the ones who are supposed to make the plans, but soon June will be acting for herself. Not longer after, Malla, describing her people's customs about old women, delivers a scathing indictment of the way society casts aside older women, treating them with pity, while older men are treated as wise, worthy of respect. During this insightful monologue, the camera cuts away to June's face, capturing her look of recognition, her wounded sidelong glance at her disinterested husband, her resentment and hurt. 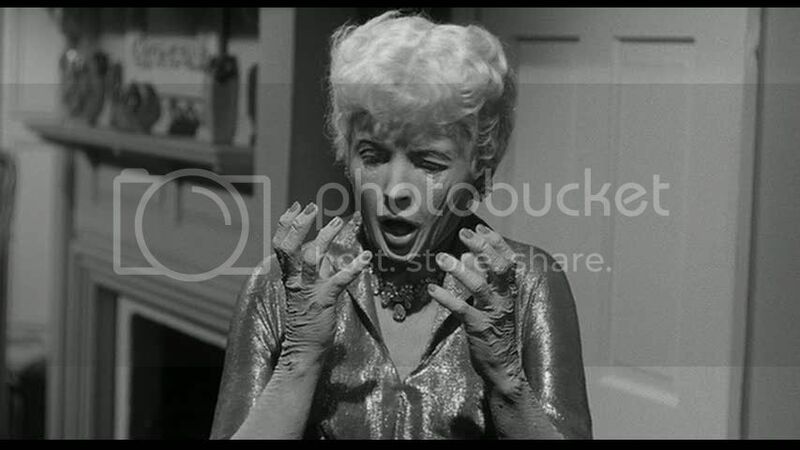 It's a moving shot, and one that helps set up her transformation into the needy leech woman of the film's title. June may eventually become the villain here, but she's a sympathetic character anyway. The men are the film's real villains: fickle, transitory with their love, capable of immediate betrayal, only interested so long as a woman is beautiful. Even Neil, June's object of affection, cavalierly casts aside his own fiancée (Gloria Talbott) for the rejuvenated June. June doesn't see it, but this only demonstrates that he's just like the other men she's known, just as inconstant and easily distracted, just as careless about love and women. This subversive subtext — questioning the values of a society that allows men to age gracefully while women are cast aside past a certain age — hovers just below the surface of a film that purports to be a simple shocker. As a horror film, it's effective enough, with some suitably creepy makeup effects for June's transformations (all of which occur conveniently offscreen or behind a curtain of fog). 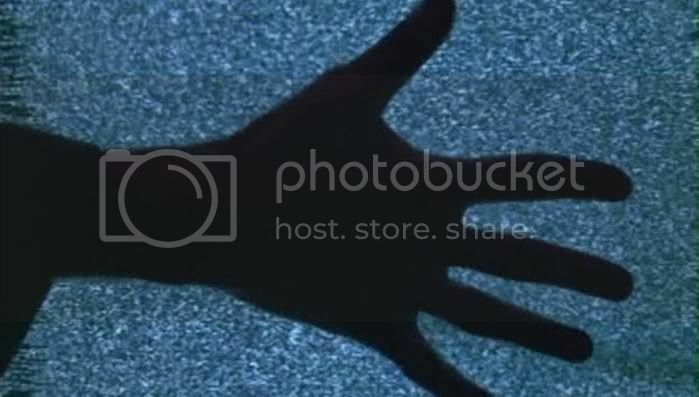 The African scenes are rather lackluster and clichéd, and the plotting is a bit light on suspense or thrills, perhaps, but despite its sensationalist surface, The Leech Woman isn't really that kind of movie. At its heart it's a character study of June, a woman driven to horrible deeds by her desire to once more be loved and accepted, to once more earn some actual attention rather than just suffering pitiably. It's a moving, harrowing tale, and a fascinating film. You do know that Edward Dein worked with Lewton in the '40s, don't you? On "The Leopard Man." A friend of mine likes to point out that Philip Terry was a Joan Crawford husband, and then draw parallels between Gray and Crawford. I have dim memories of a shot that went on forever, like unto the uninterrupted "motel room" shot in "Touch of Evil." One of the shots you described? I didn't know that, thanks for pointing it out. Apparently Dein supplied some of the dialogue for The Leopard Man. He must've picked up something from the experience because The Leech Woman is very interesting. I see that Dein also directed a vampire Western called Curse of the Undead, which I kinda want to see now -- vampires and cowboys? Nice! I don't know about "forever," but the shot I mentioned where the camera pulls back to reveal Gray sitting off in the corner by herself is quite long, which emphasizes her loneliness and isolation off there over to the side. I pretty much agree with most of the points you make here on THE DEADLY MANTIS and that in the end this is a pretty lame piece, despite th eusual goofy homor, which does make it somewhat entertaining in a minor key. The film is basically a replay of BEAST FROM 20,000 FATHOMS and THEM!, both of which are infinitely superior, and it is cheapened by its insistent use of stock footage for padding. This film is different than most of the bug movies that infested late 50's movie screens in that the bug's size was not formed by ecological or military disasters, but rather by its being frozen, and being unleashed by melting glaziers as I recall. As far as THE LEECH WOMAN, I agree with your more upbeat assessment, though again its problematic is some of its pedestraian dramatics. It speaks about the vile nature of man and subsequently the cruel fate of women, while simultaneously contending that without love one must continue with the illusion of youth. The metamorphosis of June, however, as you superbly deliniate, do indeed make this as you say a "harrowing and fascinating film" in large measure. Ray, I just looked up Shack Out on 101 and it sounds potentially fascinating and crazy. Maybe it's time for an Ed Dein blogathon next, heh. Sam, good point about the bug being natural rather than created by manmade intervention like so many of the other big bugs of the 50s -- this puts the mantis more in the lineage of Creature From the Black Lagoon, a product of nature rather than the nuclear parable of stuff like Them! Bikebali, thanks for stopping by, glad you're enjoying the site.